Walk Bike Rogue Valley | Kittelson & Associates, Inc. Thanks to everyone who provided input on this map! Comments are now closed, but you can view the input and comments received on the map. 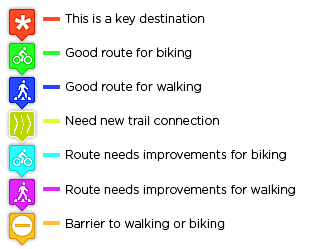 If you'd like to receive future updates about the Rogue Valley Active Transportation Plan, you can head back to walkbikeroguevalley.com to enter your email (we will not share or use your email for other purposes). For your reference, the Bear Creek Greenway is shown as a green line.